As you’d expect, we spend a lot of time talking to people. It’s in our DNA. We speak to our clients virtually every day, and we speak to prospective clients all the time. When we talk to potential new clients about why they’re considering moving their localisation to us, some common themes and concerns come up time and time again. 1. (CEO) They just don’t ‘get’ what we’re trying to do. This is a biggie. 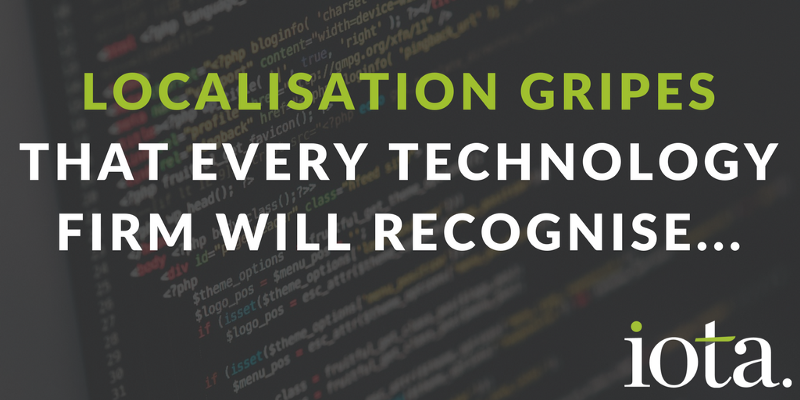 In a world where automation, technology and ‘process’ is becoming more prevalent every day, it’s easy for localisation providers to lose sight of their core purpose. Which, as we all know, should be to maximise the acceptance, uptake, and overall success of your launch in whichever language market you’re targeting. At Iota there are a number of elements that make up our ability to ‘get it’. None are revolutionary. We simply work on the basis that if a group of highly-experienced localisation experts take the time to talk to you about your business, your strategy, and your objectives they’re in with a good chance. Add a healthy dose of strategic insight, questioning, and ongoing collaboration, and you’ll understand why all of our clients are confident that we understand what they’re trying to do. 2. (CMO) Our brand voice just isn’t coming across. We hear this one a lot too. It’s usually rooted in a ‘translation by numbers’ approach, where a localisation provider selects translators based purely on the cheapest rate per word. It’s the hallmark of many large companies who boast databases of linguists numbering thousands. Instead of selecting the most appropriate, experienced, and proven translators for your project, you’ll find they run a quick search for the cheapest linguists available. Translation is an art. To be conducted well it requires subtlety, nuance, and immense skill. This is especially important for marketing copy and any content where tone and context are central to supporting your brand. To ensure your brand voice is reflected accurately, your localisation partner needs to do two critical things. Firstly, they need to make the effort to fully understand your business and what you’re looking to achieve (see point one, above). Secondly, they need to painstakingly choose the right linguists (ie. probably by hand, and not an automated search), with the right experience, and the right mindset for your project. This choice will certainly not be based on the lowest rate per word. 3. (CFO) Hey, that’s a lot of money. The money-shot. Professional localisation isn’t cheap. Legal advice, R&D, and software development aren’t either — but they all play a comparably crucial role in the success of your business. If international development features prominently in your business plan, professional localisation must be a critical component of your strategy. It’s as simple as that. Choose your provider carefully, and the investment you make will be minimal in comparison to the potential return. Choose the wrong provider, or cut corners in localisation, and you may find that the market does not respond in the way you have forecast. Taking into account the wider costs involved in entering a new geographic market, failure can be financially catastrophic. If you’re going to make that investment, it’s prudent to work with the partners most likely to help you succeed. Think of it this way — if you were heading off on a 6,000km road-trip, would you buy the cheapest tyres? 4. (CPO) You’re going to break my software. It’s your baby. Your creation. We get that. Which is why you need a partner whose engineering skills are a match for their linguistic expertise. It’s easier said than done — most can manage a Word doc or PDF, but not all can treat a sophisticated software product with the respect it deserves. Look for a partner that has no hesitation in letting you speak to some of their existing clients. If those clients include the largest and most successful providers of complex SaaS, streaming and data analysis products in the world, all the better. But what about bugs? You’ll introduce bugs! Maybe. But they’ll be found and dealt with during testing and QA. As all developers know, bugs are part and parcel of the software development process — and localisation engineering is no different. The difference comes with how your provider deals with them. At Iota, our QA processes evolve as we encounter new challenges and incorporate new methods of dealing with them. And if no bugs are found, it might be time to worry. 5. (Everyone) But I didn’t want to do it that way! Whilst there are savings to be gained from taking a standardised approach to localisation and applying a single set of processes and procedures, for many companies it simply doesn’t work. Especially the type of companies we tend to work with. These are complex, fast-moving technology firms, often with aggressive expansion targets linked to investment stages. The evolving nature of their businesses and the environment they work in does not lend itself to a rigid approach. With innovation comes unpredictability and change. And huge localisation companies don’t like unpredictability and change. It upsets them and throws up an error on their proprietary workflow tool. So every client must fit into their process, deliver files in the way they like, review them in a defined manner, and request changes via protocol number 467 of the standard operating procedure. OK, I’m being melodramatic here — but you know where I’m coming from. A responsive localisation partner will work with you to provide the most effective solution for your individual needs. That might be a willingness to use a specific translation tool you’ve already invested in and like, or it might be the ability to scale capacity up or down at short notice. It might be something as simple as being able to pick up the phone and call one of the senior team at any time — knowing that every one of them will be fully up-to-date on the project you’ve commissioned. If you recognise your own situation in any of these scenarios and would like to talk, we’d love to hear from you. If you have any horror stories of your own, feel free to share them!